Though my experience with power cords isn’t as broad as with signal cables, my experience with power for audio systems is pretty broad. You can check out my 2-part article “Rebuilding my Music Room” from January and February 2017. 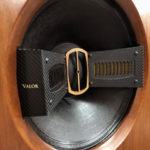 In Part 2, I discuss the upgraded in-wall, noise-rejecting 8- and 10-gauge cables I use in my five dedicated 20-amp circuits, as well as the fabulous Furutech wall sockets that make a very surprising improvement to the sound of anything that’s plugged into them. My point here is twofold: 1) my listening room’s dedicated electrical supply already makes anything plugged into it sound better that it does in a regularly-wired 12- or 14-gauge non-isolated electrical circuit; and 2) I’m very attuned to the differences between different electrical cords and power line configurations. I put the Proteus through its paces in three setups, one of which was itself broken into three varying setups, all as described below. Subwoofer Setup. Once initial break-in was complete, I ran two preliminary setups. 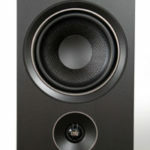 First, I used the Proteus power cords on a system that included two NHT Sub 2’s paired with B&W SCM1 monitors. This system runs off of my regular home electrical system, albeit it does indirectly get the benefit of some improvement made to the power connection coming into the home from ComEd’s feed. The Proteus were used only to power the subwoofers, since I wanted to isolate what the cords do for deep bass performance in this system separately from the mid and treble performance. The comparison cord here was the Lessloss Signature DFPC. Basic Home Stereo Setup. Here I used one of the Proteus power cords to power a Marantz multichannel AV receiver that drove two basic Polk Audio speakers, again running off of my regular home electrical system. 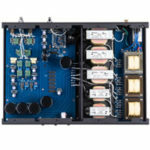 This system is entry-level, with entry-level bass performance. I wanted to see what it did across the frequency spectrum. The comparison power cord began with the stock unit that came with the receiver. Reference Setup. Once you get past the extensive electrical upgrades in the wall, my current setup makes use of upgraded linear power supplies for my server and the wonderful Legacy Audio Wavelet preamp/DAC/room correction and crossover, and Lessloss Reference DFPC power cords for my Electrocompaniet Nemo monoblocks and, depending on the time of year, the Pass Labs Xs 300 monoblocks (I also periodically use Electrocompaniet NADAs in a biamp configuration). For our purposes, one key point is that the longer the Lessloss cord, the better it sounds. I have tested this out with visiting listeners, and though the effect is not night-and-day, a majority of listeners hear a difference between 1.5M and 3M cords. I use two, 3-meter DFPC Reference cords per monoblock, with an original Lessloss Firewall in between: dedicated 20-amp outlet to 3-meter cord to Firewall to a second 3-meter power cord. The Firewall increases the effect of the power cord, so each monoblock has 6 meters of power cords feeding it from its own dedicated outlet, plus the multiplying effect of the Firewall. This was the reference configuration against which I evaluated the Stage III Proteus, and I used it with the Electrocompaniet Nemo monoblocks (600/1200 WPC into 8/4 ohms, 150 amps peak), the Pass Labs Xs 300 (300/600 WPC at 8/4 ohms, 48 amps peak) and the Electrocompaniet Nada (400/800 at 8/4 ohms, 150 amps peak). I knew when I got the Stage III Concepts Proteus that it was unused and needed break-in. Nonetheless, I wanted to get a baseline impression of its sound. In a nutshell, I wasn’t especially impressed. The sound was initially powerful, but also “brittle,” if I can use that term as an audiophile descriptor. If you obtain one of these cords without break-in, definitely plug it in and let it play for a week. I only let them burn in for 4 1/2 days and in retrospect I should have left them to play for a full week. Brian Ackerman of Aaudio Imports cooks cables for his customers, and I recommend you have him do that. After an hour on the main rig I installed each Proteus in other systems in the house and let them play for 4 1/2 days, after which I installed them in each of the setups described above. I won’t spend much time describing the first two setups, but they were instructive enough to mention. I began with the Subwoofer Setup. One of the first things I noticed was that the fit of the Proteus female end on my subs was tight. I had to line it up just right to get it to fit, and once in, it had absolutely no play when you tried to wiggle the cord. I thought for a moment that the plugs were too big, but I measured them and determined that that was not the case. The amps I subsequently used the Proteus on were slightly less tight, but still very snug. The point is the Proteus’ plugs appear to be made to the exact industry specifications for these plugs. The comparison in this setup was between the Proteus and the Lessloss Signature, which are one step down from the Lessloss Reference. 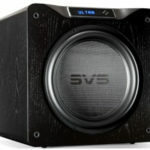 After just a few minutes of listening I noticed that the lowest frequencies of the subwoofer were more distinct and powerful with the Stage III. More extended listening also disclosed that the upper bass was fuller and more rounded. The improvements were clearly audible, even in this admittedly limited comparison. The Proteus was next tasked to power a Marantz SR7002 surround receiver, after observations of it with the stock and then the original entry-level Lessloss DFPC. The Marantz drove Polk Audio R50’s – very modest speakers driven by one of Marantz’s typically overachieving receivers. I tried this on a lark, not really expecting to get any useful information out of the listening session. First, I had to put the Marantz on the floor, since there was no way to support the Proteus with the Marantz in the rack. In addition, in order to get the best bang for the buck out of the session, I biwired the R50’s using four of the SR 7002’s seven 110 wpc channels. The source was the very good Oppo BDP 105D playing high-res discs and Tidal streaming. Given the relatively modest qualifications of the associated components, I thought there might not be any discernible change to the sound. I was surprised by the resulting additional heft and depth. Double-checking my hearing, I substituted a stock power cord, and the drop in overall dynamics and heft was immediately noticeable and substantial. I then substituted the original Lessloss DFPC and experienced a nice but modest improvement in bass definition and overall musicality. 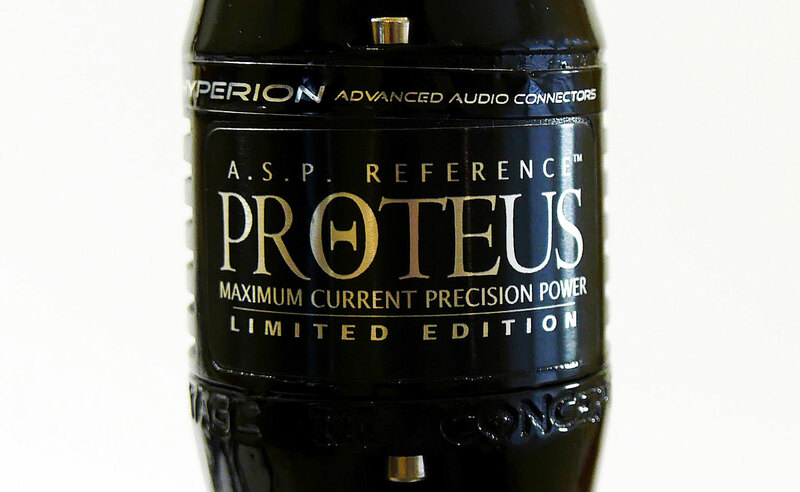 When the Proteus went back in it clearly added more power and heft and musicality. As a reminder to the reader, my principal comparison is the 2-meter Proteus compared to my existing power cord arrangement, which is a combination of two 3-meter Lessloss Reference PCs plus Lessloss Firewall (original) for each monoblock. I did this comparison with all three of the above-mentioned monoblocks.